The Russian Government approved its budget bill for 2016 on 8 October 2015. This bill was, however, submitted to the State Duma on 23 October. Why the gap between cabinet approval and legislative introduction? Officially, this period is meant to be used for ‘independent anti-corruption review’. In practice, the draft budget bill is hosted on the website regulation.gov.ru for around a week, during which experts and registered members of the public can make comments on the draft (the 2016 webpage is available here). So what? Well, it seems that important changes were made to the content of the budget proposal: overall planned spending increased in between cabinet sign-off and Duma introduction by just over 337 billion roubles – that is, by nearly $5.5 billion (US) (conversion as of 25 October 2015). By contrast, the respective change for the 2015 budget (introduced into the Duma in September 2014) was just under 30 billion roubles. If the Russian cabinet – that is, Prime Minister Medvedev and senior ministers – had collectively signed off on the budget draft on 8 October, then who was responsible for the significant changes made to the draft before Duma introduction? The Government’s sign-off decision instructed Minister of Finance Anton Siluanov ‘to finish off the bill with the participation of interested executive bodies’, and present the amended draft to the Government on 14 October. It is unclear, however, which other executive departments took part, or who was responsible for making the final decisions (although this article points to the gains made by the Ministry of Defence). What about the deficit? During the same period between exit from cabinet and legislative introduction, the deficit changed from -2.184 trillion roubles to -2.360 trillion roubles – an increase in the deficit of 176 billion roubles. Ostensibly as a result of economic exigencies, the budget planning process has shifted from a three-year to a one-year cycle. (Previous Russian budgets – starting with the 2008 budget, and with the partial exception of the 2010 budget – have included revenues and expenditures for the following calendar year, as well as two further ‘planning’ years.) The Government also pushed back the official deadline for presenting the budget project to the Duma, as well as suspending the ‘budget rule’ – a device intended to enforce fiscal discipline. 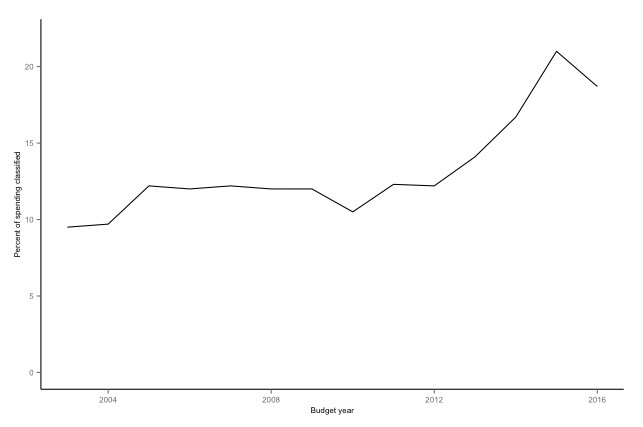 This graph compares 2015 and 2016 spending levels (as a percentage of overall spending contained in budget bills) for all 14 Russian budget spending categories. As a whole, the distribution of spending across categories is relatively similar. However, notable changes include reductions in defence and law enforcement spending, whereas the proportion of spending related to the national economy and social policy has increased. Just under 19 percent of Russian budget spending for 2016 is classified. 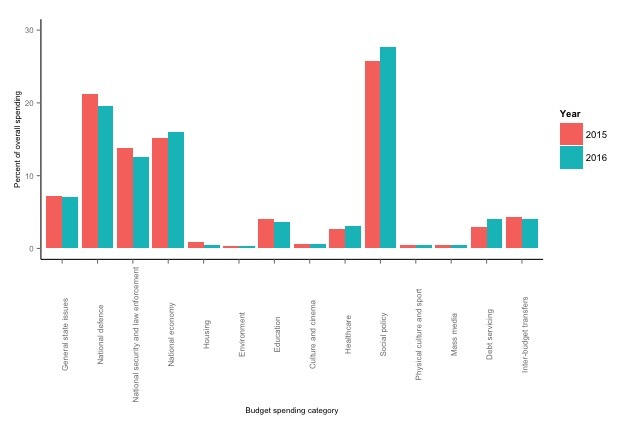 In line with existing analysis, this figure is calculated with reference to the difference between the overall spending figure and the sum of ‘assigned’ category spending figures (бюджетные ассигнования). Moreover, this figure for 2016 increased during the ‘independent anti-corruption review’ period, from 18.55 percent to 18.72. Put differently, classified spending increased by nearly 91 billion dollars – that is, nearly $1.5 billion (US). By contrast, according to a report written by experts from the Russian Academy of National Economy and Public Administration and the Gaidar Institute for Economic Policy, the 2015 budget draft saw a 289 billion rouble increase in between cabinet sign-off and Duma submission. The above points relate to budget bills. What of final budget laws? Contrary to expectations that bills submitted to legislatures in non-democracies become laws without amendment, my research shows that these figures are very likely to change during legislative review. Whereas overall revenue and spending figures are likely to remain fixed, the distribution of resources will most certainly undergo amendment. Next > Russians will be voting on Sunday [18 September]. Here’s what you need to know.